A regional favorite! Each week, teams compete in 3 games. Games play until 21pts. In the playoffs, matches will be the best 2 out of 3 games. The Winter season will play at Allentown BrewWorks. The league will play on Thursdays starting January 24th. Teams will play all 3 games in the match during the regular season. Regular season will last for 7 weeks with a 2 week playoff. Playoffs will be single or double elimination depending on the number of teams. Teams must consist of two players. (gender does not matter). Substitute players may play in a given week (Must play in regular season to be eligible for playoffs). League winners will receive gift card back to the bar sponsor. 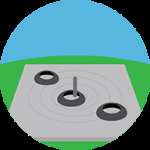 Check out this Backyard Games league '19WIN - QUOITS (THURSDAYS)' with Lehigh Valley Leagues!